When I got my bottle of Genevieve, a genever-style gin made by Anchor Distilling, I immediately tried the plain, fancy, and improved Holland gin cocktails. Then I started searching for other cocktails that took advantage of genever’s malty, strong flavor. I enjoyed the Amsterdam cocktail, which bring orange juice to the fore. Even more, I enjoyed the Rembrandt cocktail, which uses Drambuie to blend with the big bodied flavor of the genever. Naturally, the next step is to come up with my own cocktail using Genevieve. Initially, I tried experimenting with Benedictine, but found it didn’t bring enough flavor to play with the strong maltiness present in Genevieve, while bringing too much sweetness. In discussing the idea in the Mixoloseum chat room, someone suggested using St. Germain elderflower liqueur. This immediately sent me to the kitchen to experiment. St. Germain brings a lot of flavor on its own, and I found that right away, it pairs nicely with the Genevieve. Alone, the two are too powerful to be a pleasant drink, so I added some Lillet blanc to lengthen the drink and soften it up. The final drink provides a nice mix of the malty flavor of the genever with the floral sweetness of the elderflower liqueur. I decided to name it the Barleyflower after these two dominant tastes. stir over ice for at least 30 seconds, strain into cocktail glass, garnish with brandied cherry. What was your most successful experiment with a new liquor? Before i can try this i need some ingredients.. Awesome drink Stevi! I just made one up for my wife and a Rembrandt for me and we both agree that the Barleyflower is the better of the two. 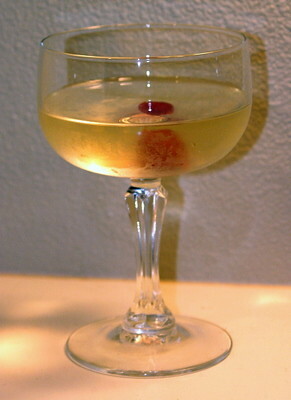 I used an Amerana cherry since my boozy cherries are with bourbon and that seemed out of place. Sylvan, So glad to hear you liked it. And thank you for the original idea to try the St. Germain! Sipping this one right now before our V Day dinner. Very nice!